Phoenix Mayor Asks Trump To Delay Visit, Hoping For 'More Sound Judgment' : The Two-Way President Trump says he's "seriously considering" a pardon for former Sheriff Joe Arpaio. Doing so would "enflame emotions and further divide our nation," says Phoenix Mayor Greg Stanton. President Trump has said he is considering a pardon for former Maricopa County Sheriff Joe Arpaio, who was recently convicted on federal criminal contempt charges. Trump is holding a rally in Phoenix next Tuesday. Shortly after President Trump posted a link for tickets to a rally in Phoenix, the city's mayor issued a statement asking the president not to come, saying, "our nation is still healing from the tragic events in Charlottesville." Mayor Greg Stanton continued, "If President Trump is coming to Phoenix to announce a pardon for former Sheriff Joe Arpaio, then it will be clear that his true intent is to enflame emotions and further divide our nation." Stanton, a Democrat, is in his second term as Phoenix's mayor, having won re-election last November. 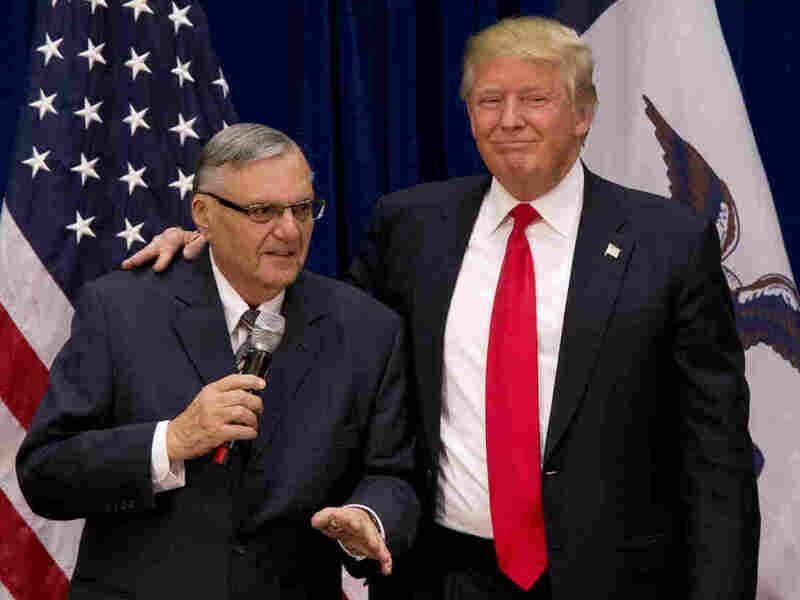 Trump's announcement of an Aug. 22 rally at the Phoenix Convention Center didn't mention Arpaio, but it immediately renewed speculation that he might use the event to pardon the controversial former sheriff who became famous for his tough stance on illegal immigration. Trump's responses to the violence at a white supremacist rally in Charlottesville, Va., have been widely criticized. After a deadly attack led to a murder charge and prompted his fellow Republicans to decry domestic terrorism, the president said there was "blame on both sides." By planning a rally and reportedly stating that he is "seriously considering" a pardon for Arpaio, Trump is seen as attempting to change the subject — and perhaps to further unite his base of support — in the face of criticism. At the rally, Trump is also expected to speak in favor of a candidate he's backing in the upcoming midterm elections; on Thursday, he tweeted his support for Kelli Ward, the challenger to Republican Sen. Jeff Flake. In recent interviews and in his new book, Flake, who refused to vote for Trump, said Republicans made a "Faustian bargain" by backing him. Arpaio, 85, was voted out of the Maricopa County office in November; last month, he was found guilty of criminal contempt by a federal judge in Arizona over his refusal to stop targeting Latinos for more than a year after a court order barred his deputies from detaining immigrants. Arpaio is facing a potential six-month prison term; he's not scheduled to be sentenced until Oct. 5. Trump and Arpaio have often spoken of their support for each another; the former sheriff backed Trump's presidential campaign and spoke at events on his behalf. News of the Phoenix rally came via Twitter on Wednesday night, when Trump posted a link to his campaign's site where prospective attendees could register for tickets. In a statement about the planned Trump rally, Stanton said, "It is my hope that more sound judgment prevails and that he delays his visit." He added that his city will prepare to protect First Amendment rights — and the public's safety — if the rally goes ahead as planned.